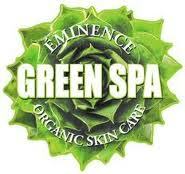 The holidays are over and it's time to re-energize and remove all the toxins from your holiday tired skin. 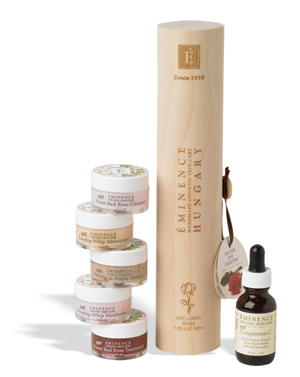 Check out our Detox Collection filled with scrumptious products specifically targeted to revive and rejuvenate your skin. Included in this set is our Citrus Exfoliating Wash, a great two in one treatment along with our Pear and Poppy Seed Microderm Polisher - perfect for smoothing out roughness, Lime Stimulating Masque to enhance circulation and improve blemished areas, Pink Grapefruit Vitality Masque rich with antioxidants to hydrate and lift the skin, Sour Cherry Whip Moisturizer ideal for nourishing and enriching moisture levels of the skin and finally, a full retail size Couperose-C Serum to comfort, calm and soothe the skin. 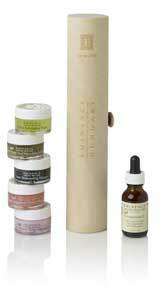 Restore tired skin with this essential Detox Collection! Some people are still trying to escape the winter cold and heading south to sunny destinations and some are hitting the mountains! Don't take off without the essentials of our Sun Care Starter Set. Don't let the name fool you! This complete set of five travel size products is the perfect way to care for your skin after being in the sun for hours or after a day on the slopes. 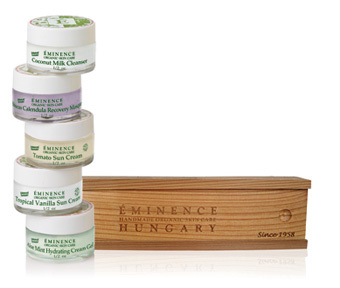 This set includes the Coconut Milk Cleanser - a great way to infuse your skin with essential moisture, Hibiscus Calendula Recovery Masque - perfect for cooling and calming sun kissed skin, Tomato Sun Cream SPF 16 a lighter SPF protection for everyday use, Tropical Vanilla Sun Cream SPF 32 - clinically tested to increase moisture content by 250%, and our Aloe Mint Hydrating Cream Gel - Face a soothing cream gel to help repair the damaging effects of overexposure to the elements without clogging pores. From surfing to skiing and everything in between, do not leave home without these five essential products! Are you shopping for that special someone? You can give the gift of beautiful skin this Valentine's Day with our scrumptious Rose Collection Tube. With each purchase of this aromatic gift set, you will receive an additional assortment of three travel size jars of Éminence's favorite products packaged in a lovely organza bag FREE! The Rose Collection Gift Tube filled with five travel size products (Sweet Red Rose Cleanser, Rosehip & Maize Exfoliating Masque, Sweet Red Rose Whip Moisturizer, Rosehip Whip Moisturizer & Sweet Red Rose Treatment) and a full retail size serum are guaranteed to be appreciated!